My sister and I love sesame chili oil but a small bottle costs a lot more than we want to spend for the amount that we use. We go through it so fast because we LOVE spicy everything. I wanted to try to make something similar using better ingredients. it didnt go very well. I used unrefined coconut oil and red chilies. I heated up the coconut oil on low heat then added the chilies. I let them meld together for quite sometime (over an hour). After i put it in a jar and kept it in the fridge. The coconut taste was too strong and the chili taste wasnt right. 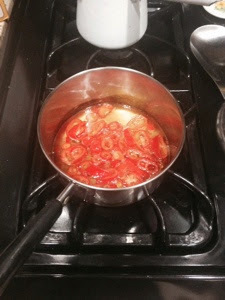 i will keep trying different oils and chilies till it turns out right (i might just have to give in a buy sesame).